I met a coach who told me that people just like me could overcome all their fears. “There is no longer any need for you, or anyone, to fear authority figures, asking for what you want or speaking in front of audiences. All the other ways that you have been sabotaging your chances to enjoy the best that life has to offer are open to you,” she said. In our middle years we get tangled up in a web of debt, work, relationships and responsibilities. They shackle us to living mainly to fulfil our commitments. We are caged in, not free to express ourselves. Our spirit is confined, but this does not stop it from clamouring for release. Frustration and a sense that something important is lacking in our lives grows inside of us like a cancer. We know that we are not fulfilling our potential. Dissatisfaction can make us grumpy but it does not help us to see a way out of our predicament. Over seven years between 2011 and 2018 the British Office for National Statistics asked more than one million citizens to rate their levels of life satisfaction, self-worth, happiness and anxiety on a scale of one to ten. 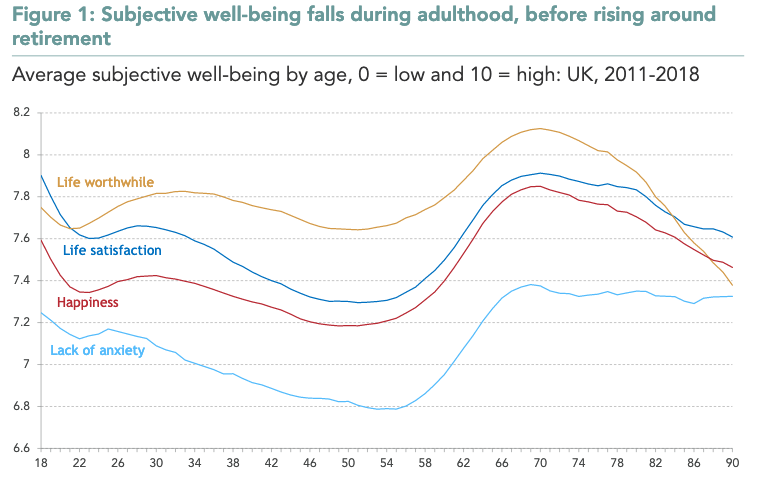 Analysis of the results carried out by the Resolution Foundation found that people’s levels of happiness peaked at the ages of 16 and 70. It is important to bear in mind that these figures are only averages, some people do seem to be able to live the dream. Their lives appear to be exciting, fulfilling and full of interest, happiness and prosperity. How do they do that? Many appear to have ample supplies of money. Money can certainly oil the wheels, but it doesn’t, of itself, solve the problems that many seem to experience. Other research shows that money comes as a result good life satisfaction rather than money being the cause of life satisfaction. In other words those who have broken free are likely to be enjoying what they are doing and they therefore earn more money. Finding ways to break free from the slavery of commitment and life rules invented by other people so that you can express yourself and find happiness has been the mission of Self-Realisation Coach David Ferrers for over 25 years. David draws on his experience of coaching over one thousand people to show you how you too can break free of the frustrations of mid life and find happiness at any age. In his practical and inspirational book You Can Start Again you will learn how thousands of others have created the good life for themselves. This is your ticket to happiness and prosperity. Grab it now with both hands.